Live the high-life in "Pelican's Roost;" an elegantly decorated 2 bedroom, 2 bathroom Penthouse unit on the 12th floor, which offers amazing views from the floor to ceiling windows. A King bed in each bedroom makes this vacation rental ideal for a couples get-away. Navarre Towers 1206 includes amenities such as a fully equipped kitchen, full size washer and dryer, and upscale resort style decor and furnishings. Access your covered, private balcony from both the master bedroom and the living room. Dip your toes into the cerulean blue waters of the Gulf of Mexico, or relax by the pool with family and friends. Make a few pelican friends and create memories that will last a lifetime. 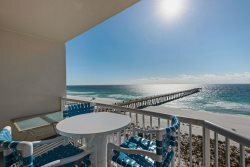 You are guaranteed to have an enjoyable, relaxing beach vacation when you and your family stay in Navarre Towers unit 1206. Check-in was friendly fast and easy. Staff was professional and helpful. This was our first experience with Navarre Properties but look forward to our next trip using them. The condo was beautifully furnished,comfortable and we immediately felt at home. The beds were especially comfortable. Our unit at Navarre Towers was quiet and restful. The views were lovely. Also appreciate the no pet policy of the Navarre Beach Pets are a choice people make and I Appreciate my choice not to have a dog respected!! Hopefully that policy will not change and this beautiful beach will remain a relaxing ,peaceful sunny destination devoid of dogs. We will continue to encourage our friends to plan their Florida vacations to Navarre area. Its Perfection! Very friendly check in staff. They were very helpful. We had the best time. I hve no complaints. Our condo was amazing. Beautiful interior, clean, incredible view, and ready at the earliest check in time! Beds were very comfortable and furniture nice and clean. Super quick to fix any and all issues. Like seriously, lightning speed quick. This condo was amazing!!!! It was clean and had an AMAZING view! Provides everything that you need to have a great vacation. Perfectly located for beach access and comfortable. I honestly do not know who would not like this condo, there is nothing not to like. We loved this place. Furnishings were beautiful and up to date. Kitchen was fully equipped for anyone who likes to cook. We would rent this specific apartment if we came back to Navarre. Outstanding condo....very clean, comfortable bed, upscale in every way. I was at a charity event when the Navarre Properties customer service rep emailed and said they couldn't get my balance to go through on my debit card and it was on a Saturday and the bank was about to close. I called my bank to see what was up and I have a security limit on my debit card that wouldn't allow it to process that much in one day so the Navarre Properties customer service rep was very kind and helpful and offered to run half that day and the other on the following day. Nice touch! Well maintained and pretty. We usually stay at Beach Colony but I would be willing to try Navarre Towers again but a nicer updated unit. Great rental! Loved the view from master bedroom! Very friendly and always smiling! We were just in awe of the property and condo. Loved that it was so close to the beach. The views were amazing. The view in the master bed room covered the entire wall. You could lay in the bed and watch the gulf waves roll in. My wife loved the large soaking tub and its steam feature. The bed in the second bedroom was as large and comfortable as the master bedroom. The pool water was heated, it was just the right temperature. It was so relaxing at the end of a day on the beach. The complimentary beach chairs and umbrella were set up and waiting for us each day. That saved us money and it was so nice not to have to lug our own chairs to the beach. I also wanted to compliment you on the fine quality on the photography on your website. I will not even consider staying at a property that will not provide me with a good look at what they have to offer. Your website is very easy to negotiate. You are at the top of my list as great places to stay at the beach. #1206 Navarre Towers The beds were very comfortable. I often find that the bed in the second bed room in most accommodation I have stayed in, are small and uncomfortable. Your bed in the second bed room was large and comfortable. I just love the complimentary beach chairs and umbrella, we used those every day. Some places do not heat the outside pool. Your pool water was warm we used that every day. we greatly enjoyed our time in Navarre. Beautiful area, beautiful & comfortable condo. It was a wonderful vacation. Like staying in Navarre which is less touristy but still close to Destin where there's a lot of activities.